Text, display, and illustrated advertisements from newspapers, periodicals, and other print publications are provided within this section. 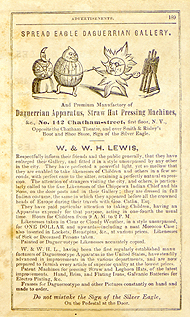 Broadsides, handbills and circulars—while advertisements—are found under "Ephemera." Please note: A quirk of the popular browser extension, "AdBlock," tends to block the "advertising" graphics in this section. The remedy is to manually adjust the settings of AdBlock to add (or "whitelist"...or filter-to-allow) this domain— http://www.daguerreotypearchive.org/ —as an exclusion to its block function.